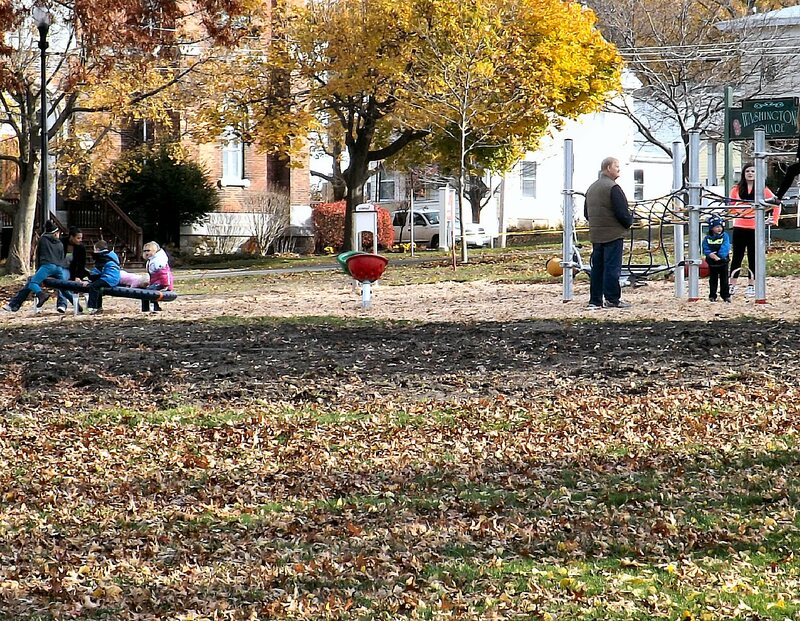 Youngsters and their families enjoyed playing in East Park, Oswego, in early November. The second half of the month received nearly 18 inches of snow - which almost all melted. OSWEGO, NY – November 2014 goes into the record books a bit on the mild side, according to Bill Gregway, local observer for the National Weather Service. “It was slightly cooler, a bit drier and as cloudy as normal,” he said. Youngsters and their families enjoyed playing in East Park, Oswego, in early November. The second half of the month received nearly 18 inches of snow – which almost all melted. The average temperature for November 2014 was 39.2 degrees. That is 1.4 degrees below average. The highest temperature last month was 69 degrees on the 24th and the lowest was 18 degrees on the 19th. The 69 tied that day’s record high, Gregway added. November had 3 days in the 60s and 4 days in the 50s. The overnight low was in the teens twice. Overall, Gregway said, the lows were 32 degrees or colder 13 times, with 9 of them being consecutive. Total precipitation for November was 3.61 inches. That is 0.86-inch below average. The greatest precipitation in a 24-hour period (1.22 inches) happened over Nov. 6-7. Since the first of the year, precipitation stands at 35.03 inches. That is 4.10 inches below normal. Snowfall for the month came in at 17.1 inches. That is 8.0 inches higher than average. The greatest snowfall in a 24-hour period was 4.3 inches on the 21st. So far, for the winter season, snowfall stands at 17.1 inches. That is 7.6 inches higher than normal. November had 19 days of measurable precipitation, with 10 of them in a row. Six days saw just a trace and 5 days received no precipitation. “We received some snow pellets on 9 occasions,” Gregway said, adding that isn’t unusual give the large amount of lake effect snow at this time. November didn’t receive any measurable snowfall until the second half of the month, he added. November also had ice pellets 3 times. The area saw 23 percent of the possible amount of sunshine last month. That is just 1 percentage below average. There were no thunderstorms or foggy days, which is normal. The number of cloudy days, 22, was average. The number of partly cloudy days, 8, was 2 above average. The number of clear days, zero, was 2 below average. November’s highest barometric pressure was 30.43 on the 21st and the lowest was 29.30 on the 24th. The strongest winds last month were west-southwesterly at greater than 40 mph. The growing season lasted 208 days, from April 20 until Nov. 14. “We never had a hard frost until Nov. 14 (30 degrees) and the growing season ended with our first measurable snowfall, 3.3 inches,” Gregway said. November 2013 was a 1.7 degrees cooler than normal. The high temperature was 64 degrees on the 1st and the coldest was 10 degrees on the 30th. There was more precipitation, 0.12-inch above average. And, the snowfall was 9 inches for November 2013, just below the average of 9.1 inches. For the season, snowfall was 10.0 inches. The warmest November on record is 48.3 degrees in 2001. The coldest is 30.0 degrees in 1933. The lowest temperature recorded in November is -1 on Nov. 30, 1875. The warmest is 78 on the 8th in 1938 and 1950. November 1963 is the wettest (9.03 inches) and 1904 is the driest (0.45-inch). The greatest precipitation for a 24-hour period in November is 3.25 inches on Nov. 30, 1963. November 1976 holds the dubious honor of greatest snowfall – 36.9 inches. Some Novembers had zero snowfall. 1897 saw the most snow in a 24-hour period with 14 inches.